Rain date Sunday, November 11. Join us for a late fall history and nature walk in Glen Providence Park! We’ll follow part of the self-guided route from the 1941 Nature Guide as we share historical photos, maps, stories, and descriptions of the glen. Learn about the park’s native shrubs and plants, as we look for wildlife and take in the last of the fall foliage! The walk will be led by me (the park history buff) and our native plant expert Marcia Tate. Be prepared for stream crossings, steep hills, and uneven (possibly icy or muddy) terrain: wear sturdy walking shoes, bring a hiking pole if you use one, and you never know when you’ll want binoculars! If the weather is iffy, we’ll post on our website and facebook by 12:00 noon on Saturday whether we will use the Sunday rain date. * Walk rescheduled from November 3 to November 10 as of 10-21-2018. 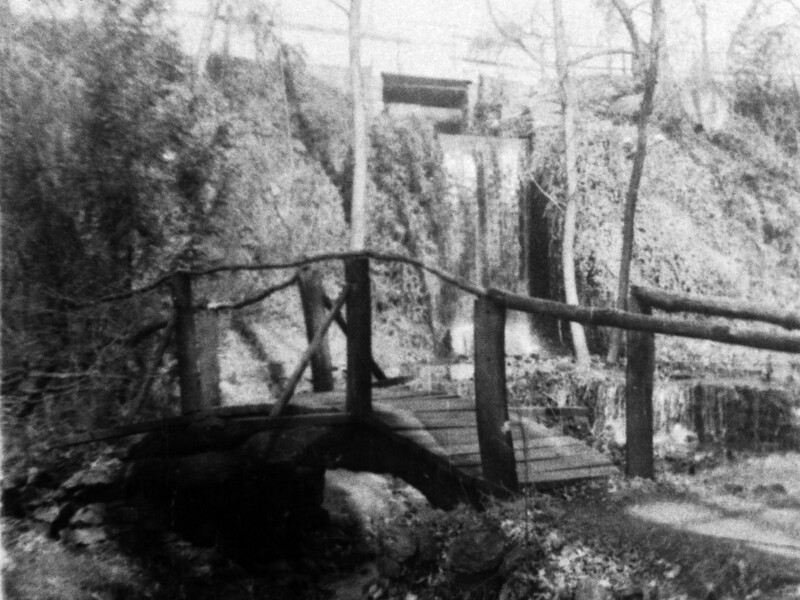 There are remains of the footers of this now-fallen rustic footbridge near the waterfall.